Pupils and students of The Aberdeen Law Project mock trial scheme, which has already been successful in several schools, this week ventured south of the City, hosting a mock trial at Kirkhill Primary in Kincorth. “The day at Kirkhill was a fascinating and valuable experience for the bright and eager pupils of Kirkhill, and also for The University students assisting. 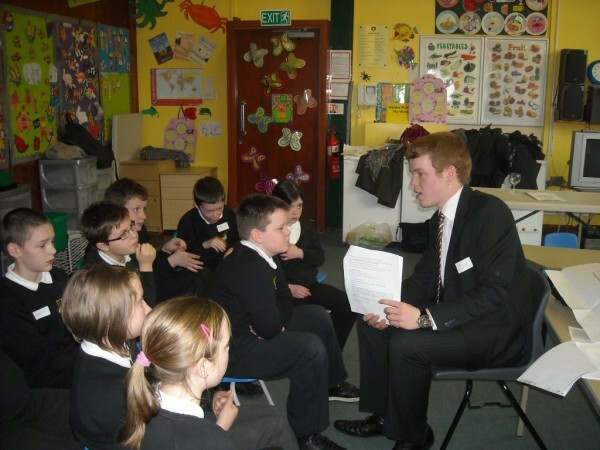 “The mock trial gave the children a unique opportunity to work with a young group of professionals to gain an insight into our legal system by participating in a mock trial where they learned to understand and adopt the roles of a variety of people, and where they felt their views and opinions were valued. “The day was a very worthwhile learning experience which clearly supports the power of contextualised learning”. It is clear that the children echo the sentiments of their Head Teacher. Dillon King (10), a junior defence advocate, “found out all about objection!”, whilst Aaron Bryson (10) and Grant Dickson (10) “learnt [that] the jury have to go to a secret room to make a decision” and that “only the jury’s opinion matters at the end of the day”. “The Aberdeen Law Project is committed to ensuring that the legal system is accessible and understandable to all with an interest. Foremost amongst those that we wish to educate – and thereby empower – are school pupils. “We hope to continue taking our schools project into North East communities, exposing both primary and secondary pupils to the legal system whilst encouraging their pursuit of higher education. I think the comments from the children only serve to underline the value of this initiative”.